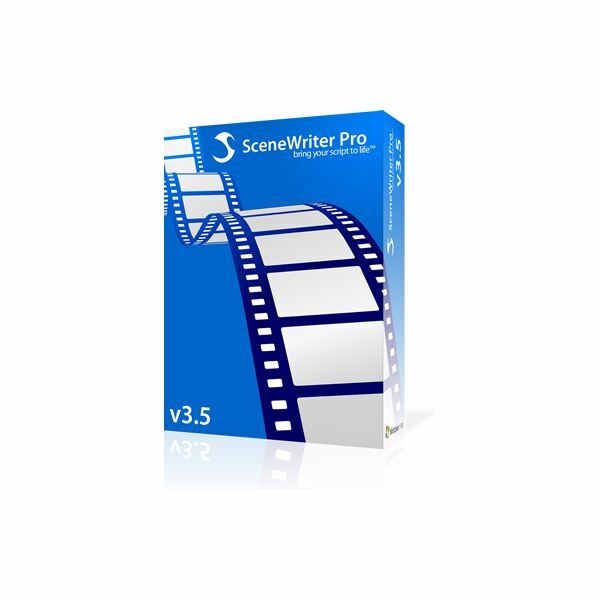 SceneWriter Pro goes about creating your screenplay in a different format by having you create individual scenes as opposed to writing the entire script at once. The first thing you should do is rename the first scene you are working on, which can be done by right clicking the “Scene One” title in the upper right portion of the screen and choosing "Rename Scene." Basically, you should rename all the scenes, so you will have easier reference when going to various scenes to work on them. To add more scenes, just use the right-click and choose “Add Scene,” naming it as well. This is a nice was to keep your scenes organized. There is also a white space beneath your scene box where you can type in notes for each scene. 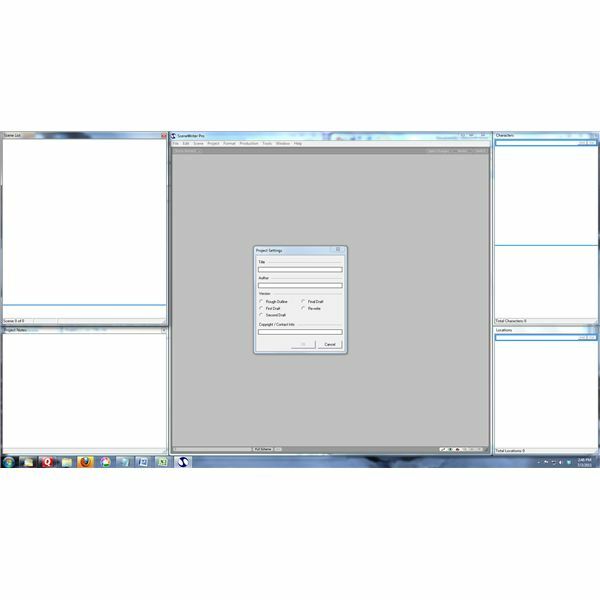 When it comes time to enter elements in your scenes, SceneWriter Pro is easy to use. The main box offers you the chance to choose from dropdown menus what you want to use. For example, you can choose “EXT,” “INT” or “I/E” for your location and then choose your location (once you do this, it will be saved in a dropdown list for future use) and then the third dropdown box includes time of day or time passage. After working for almost a decade with Final Draft, this almost seems like screenwriting for dummies, but it appears perfect for first time screenwriters. The next thing you do is choose what you want to do next, whether it is direction, which you just type in (“Jack walks into the kitchen”), dialogue (once you create a character name, just type in the first few letters and it will come up as a choice in the future) and transitions. I was surprised that the transitions – fade out, fade in, fade to black, etc. – are not automatically preloaded. Once you finish writing the scene, move on to the next scene and create your entire screenplay, scene by scene. Another nice function of this software is you can rearrange your scenes, which is often necessary but never as easy in higher end programs. The setup is nice. On the left side of the screen are the scene names which you created that you can click on at any time to work with. This keeps you from having to go through the script to find the scenes you want to use. Below that is “Project Notes” which allows you to type in pertinent information (such as genre and log line) as well as breaking your script down into the three-act structure. 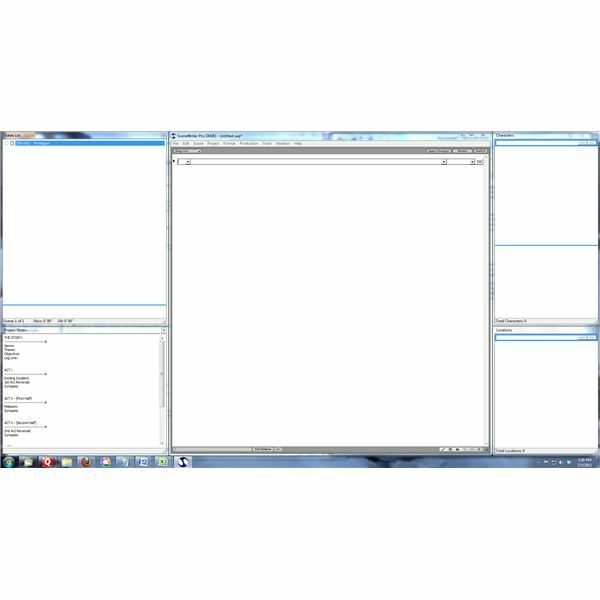 On the right side of the screen is the list of characters and locations and, in the large middle box, is your work area. It is a nice, clean interface that is simple for anyone to get used to. One big problem I have with the software is that it continued to freeze up and I have never been able to figure out why this happens. I will be typing in some dialogue, then leave the screen to go somewhere else to research and, when I return, the program is locked up on me. If I have not saved it, I lose everything that I have done. I don’t know what causes this or why it happens but it is frustrating for obvious reasons. As long as you have the Help Wizard turned on in SceneWriter Pro, the program helps you get your scripts started right. You are asked to enter the script name, author’s name and whether this is the rough outline, first draft, second draft, final draft or rewrite. You can also enter your copyright info if you want and the program will create your PDF file for you. The software breaks down the screenplay into writing individual scenes instead of the entire script at once. This has its advantages and disadvantages. If you are a writer that likes to transition into your next scene based on the prior scene, this might seem intrusive to your writing style but it does have its benefits too. For one thing, it forces you, as the writer, to focus on the scene you are working on. The script writing software almost forces you to create an outline first. As I said earlier, the way you enter the data into your scenes (transitions, dialogue, slug line, etc.) is almost like screenwriting for dummies. This makes it simple to write your screenplay by offering you easy ways to enter tedious directions and allowing you to focus your thoughts on the script itself. If you are used to working in Final Draft or Movie Magic, it may take you awhile to get used to, though. When I write scripts, I usually write fast and have gotten used to keyboard shortcuts and this software actually slows me down a little bit. For those who have no experience with high-end software, this program may be the perfect starting point. While this may not have a lot of the bells and whistles of Final Draft or Movie Magic, it is only a fraction of the cost. The retail price as of July 2011 is $59.99 but the official website offers discounts by as much as 50 percent off, making it cost almost $150 less than Final Draft. With the ease of use and the functionality, that makes this an easy recommendation for anyone that can’t afford, or chooses not to spend the money it takes to own Final Draft. If you want to try it out before you buy it, a free download is available with limited access to saving and printing so you can decide for yourself. Screenshots captured by author. Box image from company website.